If you are a follower of my blog you will know by now that I am someone who is passionate about starting home businesses from the comfort of your home. In my older posts, I have explored different ways you can give expression to the Idea of starting a home business. You can check my post on Drop-shipping if you are interested in reading more or my post on how to start an Etsy shop. While I have always recommended starting a shop, nothing beats the flexibility of online marketplace. It gives you the opportunity to stay at home and showcase and sell your products to the whole world. 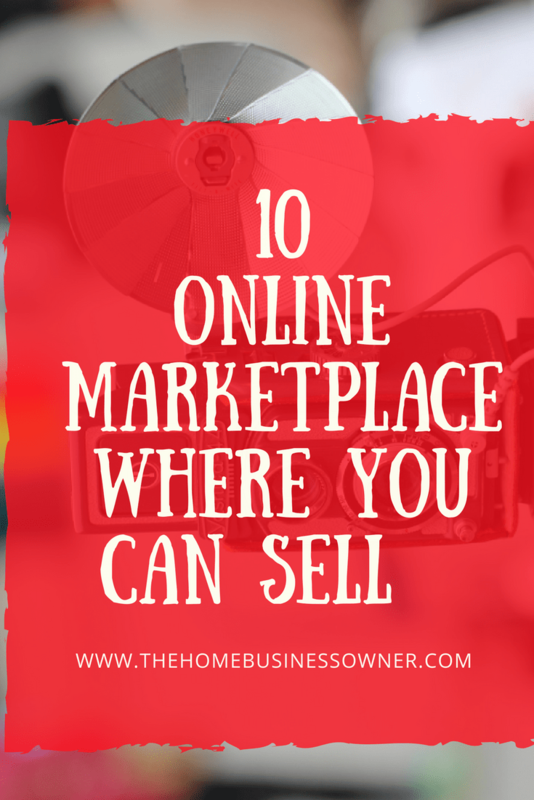 I have delved into the individual online marketplace like Bonanza and Etsy but today I am going to be exploring the 10 different online marketplace you can sell on in other to have a thriving and successful home business. I know that many people know the online marketplace giants like Amazon, Ebay and Etsy I will leave it and go to the less known but also popular and unique online market places this will make it easy for you to make a decision as to which one you would like to start with. As you read through, you will be able to make a decision based on the online marketplace you like most. Rubylane is an online marketplace where you can sell Vintage, Handmade , Antique, Artisan or Upcylced items. They feature different categories like Jewelry,Dolls, Fine art,Furniture and lighting, Glass decors,Porcelain and Pottery, Vintage fashion. Etc. If you are someone who loves to hunt for vintage and antiques that you will like to resell, then this may be the ideal place to open your online store and sell such items. When you open the online marketplace you will notice that their items are quite pricey, of course it denotes the quality of what they have to offer so you can judge how to position your shop. It costs about a 100 dollar for the first time set up fee, they also charge various fees for the different categories of items. Click here for further details. The good thing about this online marketplace is that they enforce MAP(minimum advertised price), this means there is a threshold to which you can price your products, this prevents unnecessary price wars and helps ensure that every one has a good price fro their products. Wanelo is like your average shopping mall,you know the Macy’s of this world, only that it is online. It is an online marketplace where people can apply to sell their goods, it features basically fashion items and has about 350,000 stores on it. The good thing about Wanelo is that you have independent sellers and also Fashion brands who open stores on their platform. Wanelo was opened in 2012 and has listed about 30 million products. Millions of shoppers use Wanelo as their place to shop for items they love without having to set foot in a brick and mortar shopping mall. They can shop from their different brands and combine all into one shopping cart. Kind of like your regular Polyvore without having to visit each shop independently. You can apply to sell on Wanelo by installing their sales channel, this costs you nothing. Your shop is then sent in for approval, once approved you can begin to upload pictures of products you wish to sell. The Wanelo systems charges you 15% commission for every order fulfilled and will also help you sync your products from your shopify store in case you already have one before you went to sell on their online marketplace. -You can have your own custom domain name and they also offer multi currency support. If you are a stay at home mom who love handmade and crafted goods, you may consider this as an answer to your prayer of getting your goods out there for others to buy. They offer you the easiest way out with listing of unlimited items for no fees. Its something one should consider. It’s a good alternative to Etsy if you feel that Etsy is so big that your items will not be noticed if posted there. Zibbet has about 54,000 online stores currently on its online marketplace. I know when you think of sears you are seeing a brick and mortar shopping mall, scratch that sears is online and is currently offering individuals who want to sell an online marketplace where they could sell their products just like Amazon does. It also offers fulfilled by sears, just like you have Amazon currently doing. All you have to do is sign up in their online marketplace and you are good to go. Sears takes its payment after you have made a sale. You can read up on this on their page, if it interests you. Artfire is an online marketplace where crafters and sellers of handmade goods can showcase and sell their goods just like you would on Etsy. It features different categories of items like Jewelry, kids, wedding, home and living , clothing and accessories and also entertainment. It’s a great alternative if you seek to showcase your goods on a smaller platform where you feel your goods will gain more buyer attention. One of the good thing about this platform is that it has no listing or selling fees, it also features a well developed online community forums, because people who visit Artfire are looking for specialty items, they are more likely to buy from the shops on the platform. Flipkart is an online marketplace that is founded by Indians and available for all to sell on. Gist has it that the founder was refused an immigrant visa in the US after schooling there hence he went back to his home country and founded Flipkart. It’s a billion dollar eCommerce giant much like Aliexpress and Amazon. It helps people who want to showcase and sell their products especially to emerging markets like India to do so. Jet.com is a new online marketplace as compared to others that are listed above but it is making waves especially since Walmart said it will acquire it. So if you want to tap into a market place that will have the backing of Walmart retail giant, then now is the time to open your online store on jet.com. It features different categories like Grocery, appliances, home decor, furniture and lots of other features which you can find on their online marketplace. Just picture your average Walmart store and you won’t be far from the truth. You can start your online shop on this platform by applying and once your application is approved you will be allowed to set up your retail portal on their platform. Benefits of this platform is that its that they help you manage your competitiveness and profitability via their search engine optimization. This is an online market place which is a bit new but has the opportunity to list your items for free and pay a commission after you make a sale. The commission is usually about 10% of your total sale. This is an online marketplace where you can sell things for free, there is no listing fee and they have the advantage of featuring your items on Bing shopping, Google shopping , Thefind and Shopwiki. Your products also gain exposure through their RSS feed and other social media button options that they provide to make sure that millions of shoppers find your products. Just what I’ve been looking for. Nice to see other places to sell other than Etsy and a EBay. Thanks Shana, I am glad you liked it. Thank you for this list, I have only heard of one of these before. And I had no idea that Sears was in this business. Thanks Nicole, Sears is also fulfilling orders for their sellers. Such a great list! I am looking to sell some of my stuff! Will check these out! Thanks Belle, I hope my post becomes a useful resource you can refer back to in your journey. I hadn’t heard of most of these! Definitely need to check them out!